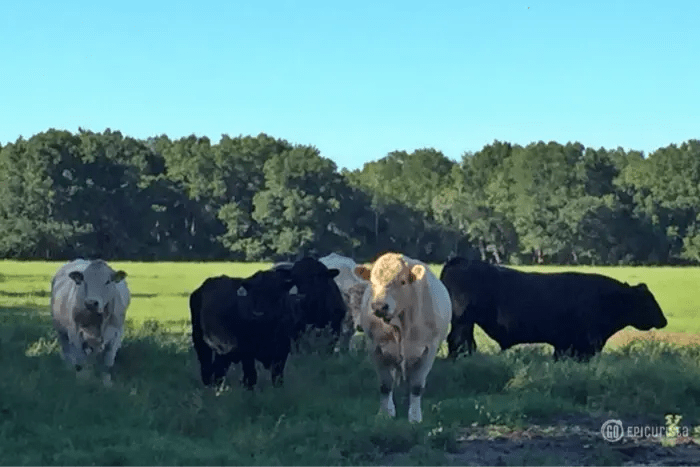 Did I ever tell you about the time I visited Gainesville, Florida and the surrounding areas, home of some of the most prominent cattle ranches in the state? I hung out with Brahma bulls, went back to college, learned about different grades of beef, saw “beefalo” on the side of the road, tasted sushi made of American Wagyu and even won a cooking challenge! This recipe for My Big Lean Beef Greek Wrap is inspired by that epic experience and our winning dish. 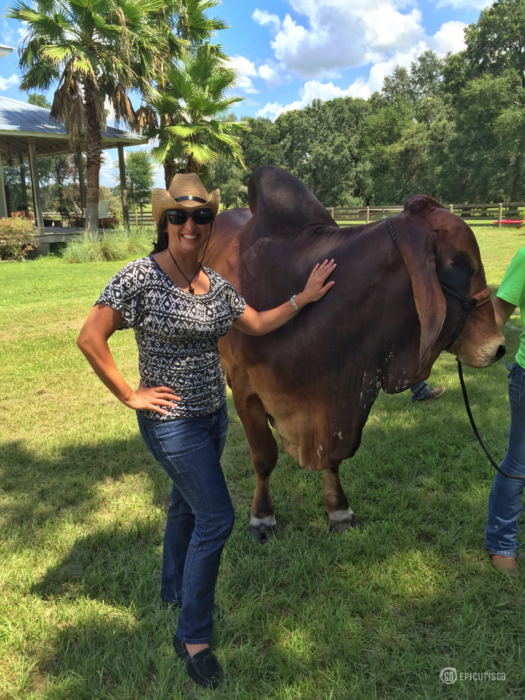 The Florida Beef Immersion experience with Sunday Supper Movement and Florida Beef Council was one of the highlights of my year 2016. You can read more about it here. 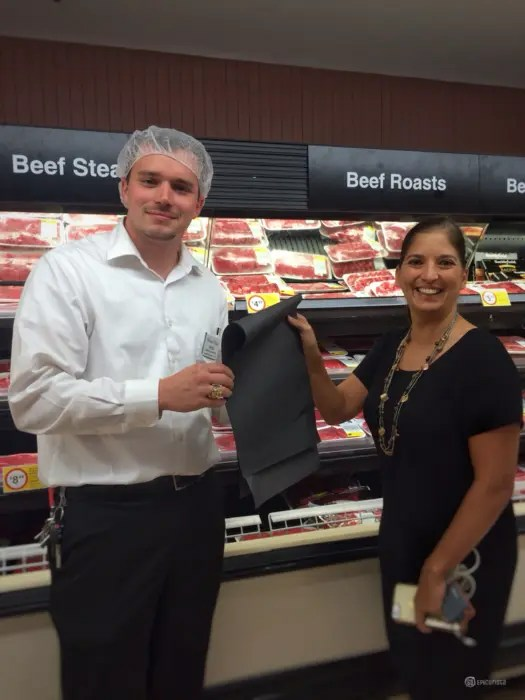 Beef gets a bad wrap when it comes to “healthy eating” but after learning about beef, where it comes from, how it’s raised, all the various cuts and nutritional values, this meat-lover is thrilled to keep finding new ways to incorporate lean beef into her diet. 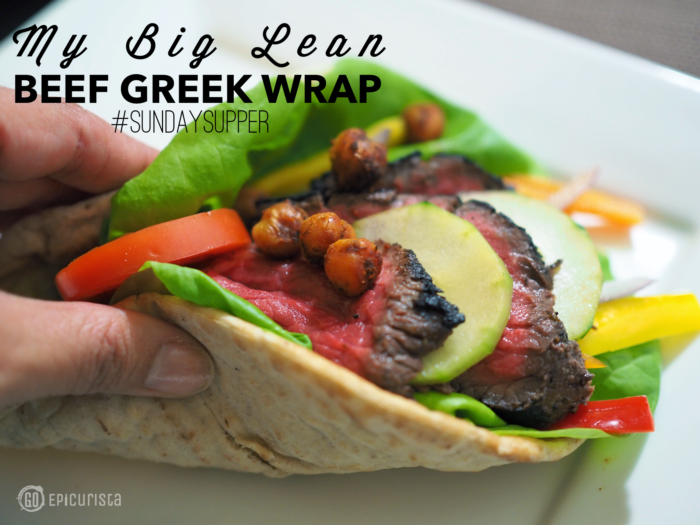 This is why I’ve teamed up with Sunday Supper this week to bring you an awesome selection of Lean Beef recipes in addition to My Big Lean Beef Greek Wrap. It’s a good wrap about beef. • Three ounces of lean beef has more iron than 2 ¾ cups of spinach. • Lean ground beef has fewer calories than ground turkey with 162 calories in three ounces of ground beef to 176 calories in three ounces of ground turkey. • Lean ground beef also has less fat than ground turkey: 7.5 grams for three ounces of beef and 9.7 grams for ground turkey. • Beef is a great source of 10 essential nutrients: iron, choline, protein, selenium, vitamins B6 and B12, zinc, phosphorus, niacin, and riboflavin. • A 3-ounce serving of lean beef provides your body with 25 grams of protein, which is half your daily protein needs. 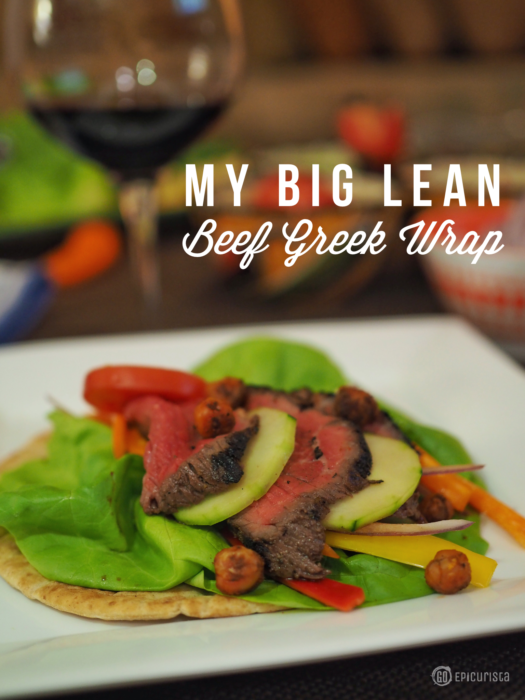 This recipe for My Big Lean Beef Greek Wrap is perfect for Easy Entertaining at home and the best part is that it’s in the “lean and healthy” category so no one feels guilty about enjoying themselves. It all starts with a team and I had an awesome one! Sondra Cernigliaro of GirlAbroad.com, Terri Truscello Miller of LoveandConfections.com and I called ourselves “Team Ya Ya”. 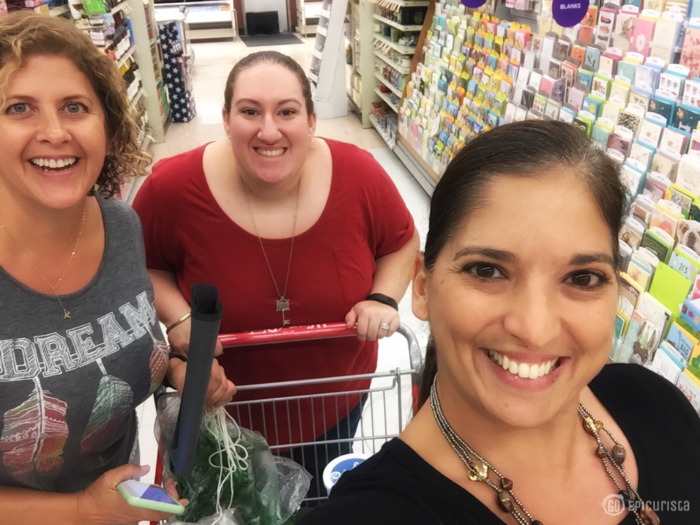 With 20 minutes on the clock to create our recipe and shop for ingredients, we rushed around the grocery store like we were playing Guy’s Grocery Games on TV. It was quite hilarious. I wish someone had captured the perplexed curious looks of other shoppers and staff as 20 bloggers ran around the store. We were too busy, although not busy enough for a selfie. “What cut of beef should we get?” was the question on everyone’s minds. – We knew it had to be lean. Some great options include strip steak, sirloin, top round London broil, tenderloin, skirt steak, and lean ground beef. We cornered the head butcher and begged him to find us the best cut of lean beef he had, at the best price of course, because we had a set budget. We even convinced him to give us butcher paper and twine for our winning presentation. He was a classy dude and found us a petite tenderloin on sale. We needed high quality, flavorful and a cut that would cook quickly. To win the competition, we went with the best cut of beef we could afford! Here’s a tip: Always ask your butcher for help selecting the best cut of beef. The butcher is always my go-to-person when trying to decide the best cut for a recipe, to learn how to prepare cuts of beef I’m unfamiliar with and to find the best deals. 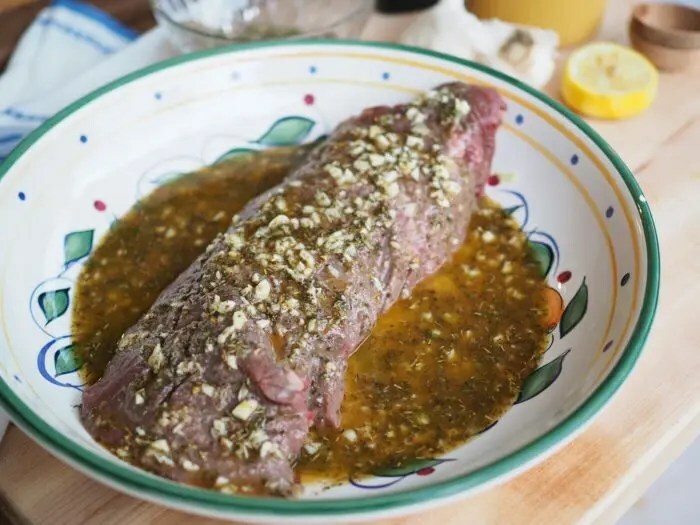 For this recipe below, my butcher recommended top round London broil. It’s economical to feed a large group at a party, very flavorful, lean and works well thin sliced in a sandwich or wrap. The downside is that it requires marinating which is why you must plan ahead. But, it does cook quickly on the grill. In the small test kitchen of University of Florida Department of Animal Science kitchen, all teams shared burners and ovens, utensils and spices. Chaos doesn’t begin to describe it! I don’t know how they do this on TV! We had 30 minutes and if you think that’s a long time (as we originally did), it isn’t! Our burner didn’t work, the blender wasn’t pureeing the cucumbers for the tzatziki and it was time to improvise. We seared our steaks, prepared our tzatziki by finely chopping and mashing the cucumbers, roasted our cayenne chickpeas in a pan (which may have been a tad too spicy according to one judge!) and ran downstairs to present our dish at the buzz of the clock. Phew! It was close and all teams did an amazing job. We won by a small margin but we were so proud of our dish. This is why I was excited to recreate it at home to share with friends and with you. The recipe is also inspired by the most famous Greek wrap of all, the gyro. Although it has some ingredients in common (pita, tzatziki cucumber yogurt sauce, lettuce, tomato and onion), it is vastly different in flavor profile and I think will become your new favorite. The addition of pan-roasted cayenne chickpeas gives it a nice flavor and texture contrast with the cool cucumber yogurt tzatziki sauce. The lean beef in place of lamb makes the dish much more approachable to everyone’s palate when serving at a party and its also less fat. 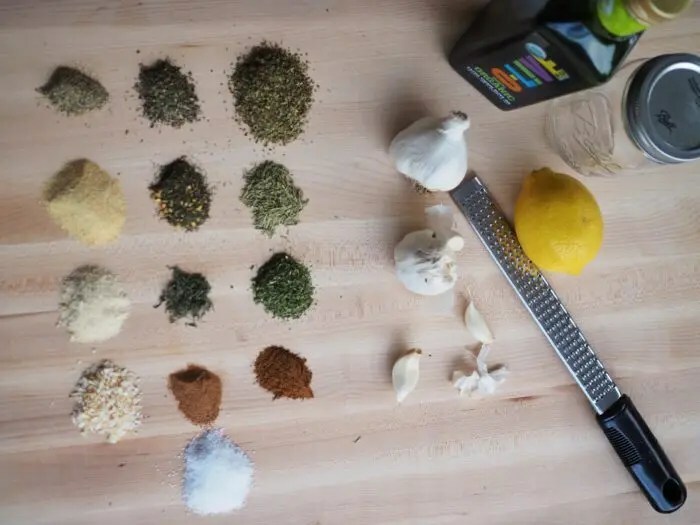 Having the luxury of time to plan and shop for this recipe, I chose a healthier but a bit more time intensive Greek marinade to flavor the beef. 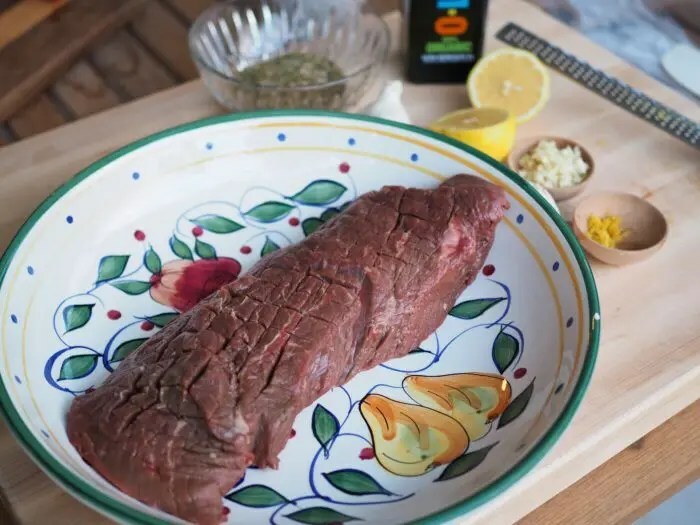 Top round London broil is an economical and full flavored cut, but it requires marinating to tenderize. 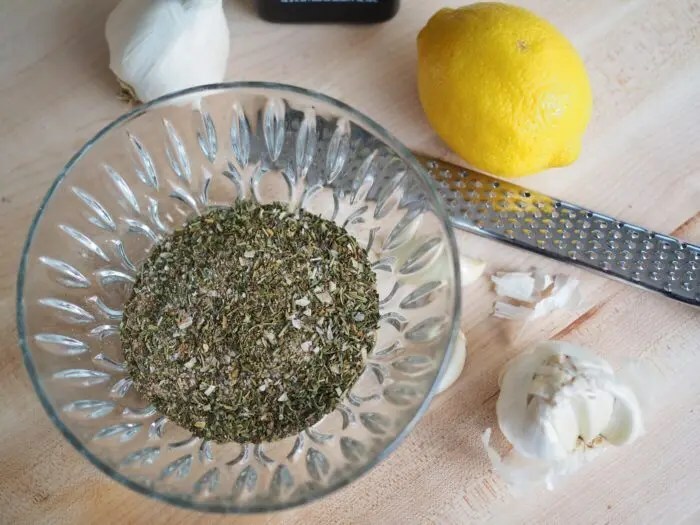 The Greek marinade with garlic, fresh lemon, olive oil and a Greek seasonings blend was so fragrant and flavorful you’ll want to try it on other proteins too. Some choose to marinate overnight but you can still get lots of flavor with 2 hours marinating at room temperature. Just place it in an airtight bag on the counter and let it rest. This also brings the meat to room temperature before cooking, which is important for it to cook evenly. It’s what chefs call “tempering your beef”. Scoring the beef with small criss-cross incisions also helps the marinade soak in. Grilling London Broil is easy as long as your grill is hot, at least 400 degrees F, and you don’t run out of gas. 5-6 minutes per side depending on thickness will give you perfect medium rare. London Broil is best at no more than medium or else it will get tough and that’s no fun. Once you remove from the grill, let it rest for at least 5 minutes before thin slicing, against the grain. This recipe serves 6 full size wraps. – Combine all ingredients in a mixing bowl. – Make small criss-cross incisions on the beef and place beef and marinade in food-safe plastic bag. Turn beef to coat evenly. – Marinate in refrigerator as long as overnight or as little as two hours at room temperature prior to cooking. This recipe yields 3/4 cup so keep the remainder in an airtight jar for future use on beef, chicken, fish and pork. – Mix all dry ingredients and store in airtight container. – Great as a dry rub for steaks, chicken, pork chops, fish and vegetables. Prepare the tzatziki sauce after marinating the beef and store overnight to allow it to set. 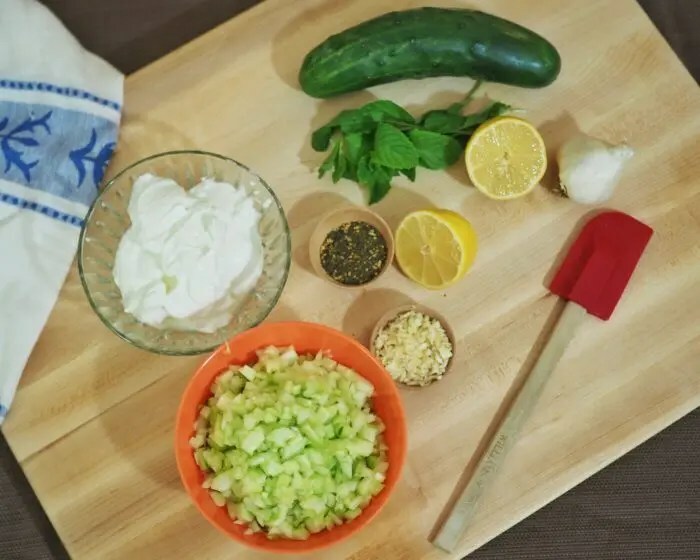 The key to the tzatziki is draining the liquid from the yogurt and the cucumber so the sauce does not get watery. – In a food processor or blender, combine all ingredients and process until well combined. – Transfer to a covered dish and refrigerate at least one hour, best overnight. – To help with a thicker consistency, drain the cucumbers of as much liquid by using a cheese cloth or squeezing. – Present above ingredients on a tray for guests to help themselves. – The spice level can be adjusted by reducing the amount of pepper and cayenne. We added a bit much for one of the judges which added some comic relief to the festivities. Whether you are throwing a casual gathering for game day or having girlfriends over to binge watch your favorite TV shows, this recipe will be loved by both guys and girls. 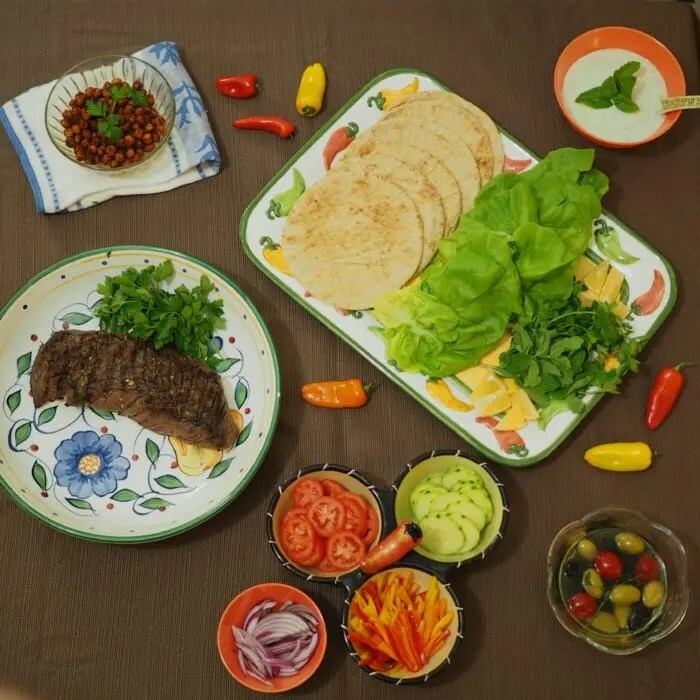 By having pita wraps and lettuce leaves you can give alternatives for those who are gluten-free or want a leaner version. 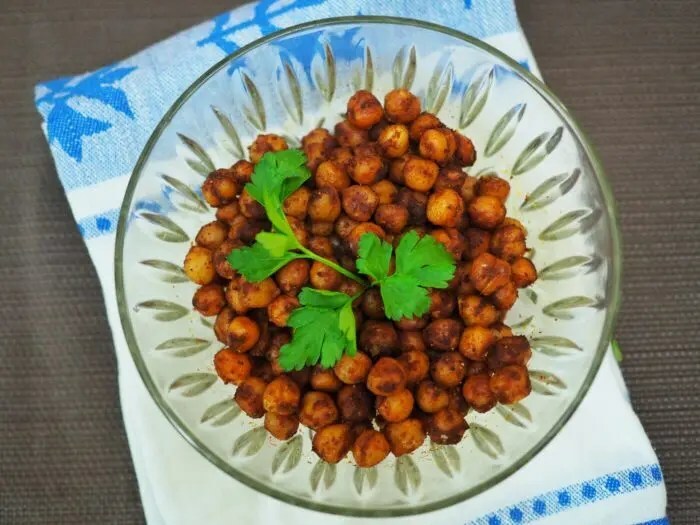 The pan-roasted chickpeas and all the veggies also provide a filling alternative for any non-meat eaters in the group. Sarah Bates from The Chef Next Door is hosting this week’s Lean Beef #SundaySupper. Check out the recipes from the Sunday Supper Tastemakers and go ahead and invite some friends over for this epic lean beef fueled celebration. Go #MakeSomedayHappen one delicious bite, sip and trip at a time! Go Epicurista and a prized bull! Pin This! Save it for Later! How much fun was that competition?!! 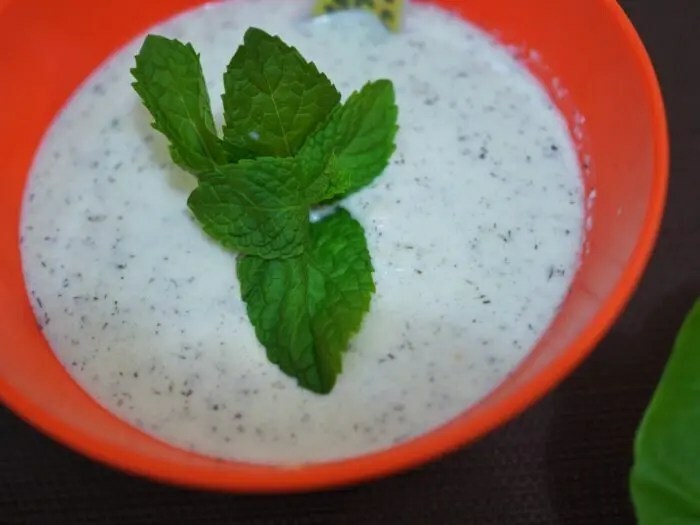 Thanks for sharing it with us and thanks for this wonderful recipe….Just LOVE the name. Great post. Thank you so much! It certainly was a lot of fun. I still can’t believe I’ve won a cooking competition! Hope you get a chance to try the recipe. It came out super tasty. Cheers! lots of big delicious flavors, sounds great! Yes! This is full of flavor and you can always turn the heat up or down if you want. Cheers! You put together an amazing sandwich! Thanks for sharing your story. Sometimes under pressure we do our best! Thank you Cindy! I always work great under pressure although it is nice to have a bit of time to plan and enjoy the process. Cheers! This sounds awesome! I love that you made a Greek wrap and it has so many different flavors! Thank you! I always use lots of ingredient with lots of flavor, especially when looking to eat healthy. It makes it more fun! I LOVE London broil. It’s such an under rated, under appreciated cut of beef. These look delicious! I agree! London Broil is totally overrated. I was reminded with this recipe how much I like it and how rarely we cook it at home. Thanks for checking out the blog! 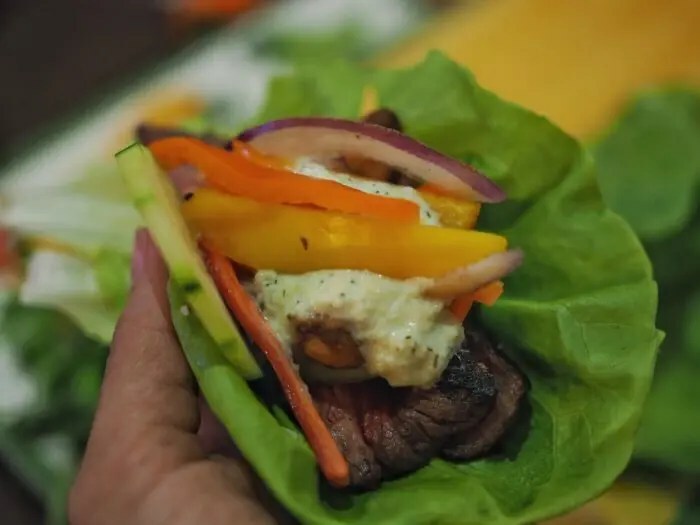 Love reading about your beef experience, And these wraps look and sound delicious! Thank you! I hope you enjoy them with family and friends. Cheers!